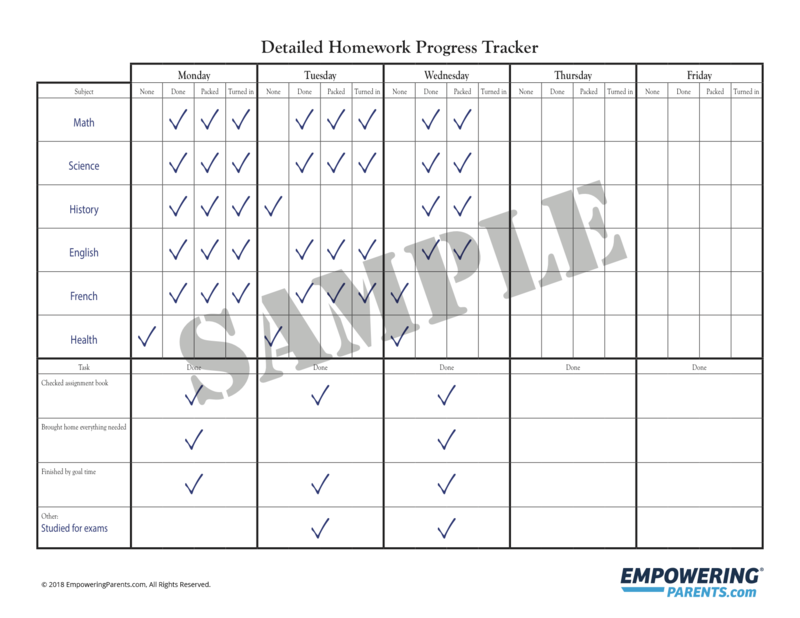 The homework progress tracker allows you and your child to keep track of several homework related activities. It is important that you help your child with this for the first few weeks to ensure that your child understands ho to use it. You could also involve your child’s teacher with certain portions of this chart. For example, you could ask your child’s teacher to initial the chart when an entire homework assignment has been turned in. This might be more appropriate for some children, particularly those who have a history of being dishonest about school work. Before you begin, you should decide where you will keep the chart. For this chart, it might be best to slide it into the front outside of a binder with a clear plastic cover, or slide the chart into a clear sheet protector inside the binder. It is important that the chart is in a place that is readily accessible and visible. Kids who have ADHD can benefit if the chart is in a spot where they will easily see it. This will help them remember to use it. To begin, enter your child’s class subjects in the left hand column. For the first week you simply sit with your child and go through the worksheet together each day. Working one subject at a time, have him either check “None” if there is no homework, or have him do his homework before checking the “Done” box. The “Packed” box should be checked after the assignment is put in the child’s folder and/or backpack. Your child is responsible for checking the “Turned In” box when he hands in each assignment the next day. Once his homework is done, enter checkmarks for the appropriate boxes on the lower Task section of the worksheet. You may add other tasks if desired. If something is not complete, simply leave the box blank. It is not recommended to put any negative words or symbols such as “No” or a frowning face. At the end of the week, count up the number of checkmarks your child earned each day or for the entire week. This is the baseline. Now that you know the baseline, you can set a goal for the following week. Daily goal and reward system: The maximum number of checkmarks your child can earn each day with the chart unmodified is 22. Suppose your child currently gets about 10 check marks each day. It is not reasonable to ask your child to immediately begin getting 22 check marks each day. Rather you want to start where he is and slowly work forward. You might make it a goal for your child to get 15 checkmarks per day next week. Each day your child reaches 15 checkmarks next week, he would earn a reward such as an extra half hour on the computer. Weekly goal and reward system: You could also offer weekly rewards. You count up the baseline total of checkmarks during the first week- let’s say 50 for the week as an example. For the next week you might set a goal for your child to earn 65 checkmarks. If he gets 65 or more checkmarks next week, this would earn him a larger reward on the weekend such as going to the movies. As your child achieves each goal, you can slightly increase the goal for the following week. Don’t hesitate to mix up the rewards if your child is getting bored, or offer two choices for your child to choose from. Get your free Advanced Homework Chart now! Simply enter your email address to download this item. Plus, receive the FREE Empowering Parents newsletter with a weekly selection of featured articles, practical parenting tips, and special offers. Thank you, your download should begin automatically. Please click here if it does not begin within a few seconds.